News correspondents (or journalists) gather information, prepare stories, and make broadcasts that inform us about national and international events; present points of view on current issues; and report on the actions of public officials, corporate executives, interest groups and others who exercise power. They spend a lot of time in the field, with constant demands to meet deadlines and to be the first to publish a news story on a subject. In covering a story, news correspondents investigate leads and news tips, look at documents, observe events at the scene and interview people. They take notes, which they use to determine the focus or emphasis of their stories. Many news correspondents electronically submit the material to their offices from remote locations. Radio and television news correspondents often compose stories and report ‘live’ from the scene. At times, they later tape an introduction to or commentary on their story in the studio. Why did you choose this profession? I didn’t choose it, it chose me. That may sound clichéd but it’s the truth. After school I studied civil engineering at Witwatersrand Technikon in Johannesburg. It took me five years of working in the field to realise that it was not for me and I quit. In my search for any job that would pay my bills, I landed an insignificant position at a current affairs show and fell in love with journalism. What training did you undergo? On-the-job training. Some say it’s the best way to learn and I believe acquiring formal training in something you love is half the journey travelled. It is through experience that most of us learn the most important lessons that end up shaping our lives. What kind of personality suits journalism? You have got to love people and be patient – most good stories come to those who wait. Most importantly, you have to care about the people and events you report on. What do you enjoy most? I learn something new every day and meet incredibly interesting people. If a story about illegal organ transplants breaks, for example, I have to quickly familiarise myself with the laws that regulate operations in the country concerned. It’s important to be able to locate people or information that can help me become an instant expert. What don’t you like? Sometimes dealing with government officials can be extremely frustrating. Many of them do not return calls, have no sense of urgency and generally feel they should not be answerable to anyone. Journalists are the last people they want to deal with. What’s been the highlight of your career to date? I’ve had many. Barack Obama’s African roots made covering the 2008 American presidential elections extremely exciting for me. I was in his father’s village, Kogelo, in Kenya. People who had never seen a television set, never mind followed a US election, were glued to screens brought into the village for all to witness history unfold. When the announcement was made that he had won, old ladies danced alongside school children as the whole community erupted in jubilation – truly unforgettable scenes. Obama’s visit to Ghana comes a close second for me. His motorcade drove past us while I was live on air and it was really special to witness the enormous admiration and love that ordinary people have for him. Any advice to impart? Work hard. Be humble and keep learning. Learn from those you admire and also from those you regard as intellectually inferior. Future goals… My biggest personal goal is to shape my seven-month-old son into a responsible and open-minded young man who will make a positive contribution to his country, community and fellow man. Careerwise, I would like to tell more stories that change the lives of those they are about and alter the thinking of those watching. Your job in three words A constant thrill! What does your job involve? I am the senior political journalist responsible for the Sunday Times parliamentary coverage. Why did you choose this profession? When I was younger, I liked reading anything I could get my hands on. As I grew up, I began to enjoy debates on political, social and economic issues. It was always my dream to report and analyse issues that affect people on a daily basis and I couldn’t imagine a better platform than journalism. What training did you undergo? Bachelor of Arts (with majors in English, Politics and Geography); BA Honours (Political Science); Bachelor of Journalism (Honours); and a BA Honours (International Politics). Is there a type of personality best suited to this job? You have to be very inquisitive, have the ability to withstand criticism (a thick skin) and most importantly, you mustn’t be a clock-watcher. How does experience weigh up with formal training? Formal training is very important, I don’t think I would have made it to this level without it. But training need not be the same as mine. 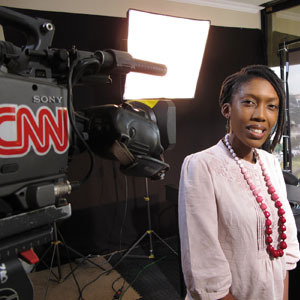 Many journalists have trained in various other fields before they trained in journalism, some trained as journalists immediately after grade 12. Once you get started you learn every day, thus, experience is also crucial. Describe a typical day on the job A normal day begins at my house… while having breakfast, I tune into a radio news programme. On arrival at the office, I read the morning newspapers and browse local and international news websites. By then I have a good idea of what is going on and proceed to make phone calls, or attend meetings with news sources. When Parliament is in session, I normally scan the parliamentary programme for the day: it indicates what is under discussion in Parliament’s committees, and in the parliamentary chambers, the National Assembly and the National Council of Provinces. I then decide on the most important parliamentary activity to follow. On average, I attend no less than five meetings a day. When a matter under discussion requires no further research, I will immediately write and publish it on The Times website or file it for publication in The Times the following morning. If a story requires further investigation, I will gather more information on the subject. On really hectic days, I usually forget to have lunch (a bad habit). I’m supposed to knock off at 5pm, but I can’t recall the last time I left before 6pm. What aspect do you enjoy the most? I get to know a lot about what is going on in the world because I interact with political decision-makers on a daily basis. I know more than I ever write about. The more you grow, the more influential you become. Journalists are the most influential people in the world – alongside government officials and judges. What’s been the highlight of your career? Every time my name appears in the newspaper makes for a career highlight because each time I write, I keep a number of people informed about political developments. I inform the public about, among other things, government’s ability – or lack thereof – to deliver on its promises to the people after an election. Any advice for young people starting out as journalists? Don’t expect to be a millionaire. If you work hard, you will live reasonably well, but you certainly will not be rich. You have to love the job. Journalism is also addictive if you really have passion for it. Be ready to make as many enemies as you will friends: not everyone in government, opposition parties, civil society groups and among the ordinary members of the public will appreciate your harsh and honest pen. It is not necessary to have an academic background to work in journalism, though employers generally prefer people who have a diploma or bachelor’s degree in journalism or communications. A National Senior Certificate that meets the requirements for a diploma or degree course is a prerequisite for these courses. It is also important to have practical experience from an internship or from working with print or broadcasting in an organisation. Some employers offer on-the-job training learnerships, which combines theory and practical training.